This entry falls somewhere between a compilation of links/resources and a proper essay. 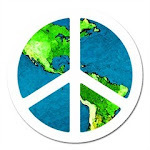 In this blog posting, I wanted to reflect a bit on the global refugee crisis that's currently in the news and consider how (or if) medievalists might respond to what's happening in Europe and elsewhere. The Refugee Tales Walk is a collective effort by activists and storytellers to showcase the stories of refugees indefinitely detained in the UK; taking its cue from Chaucer's Canterbury Tales, the project tells stories of lives in transit. 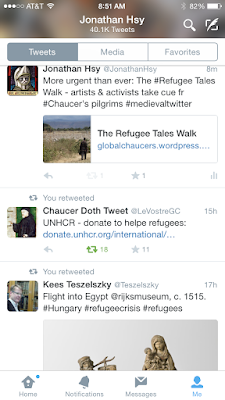 Note this brief blurb on the Global Chaucers blog; you can also follow "Refugee Tales" on Facebook or on twitter. 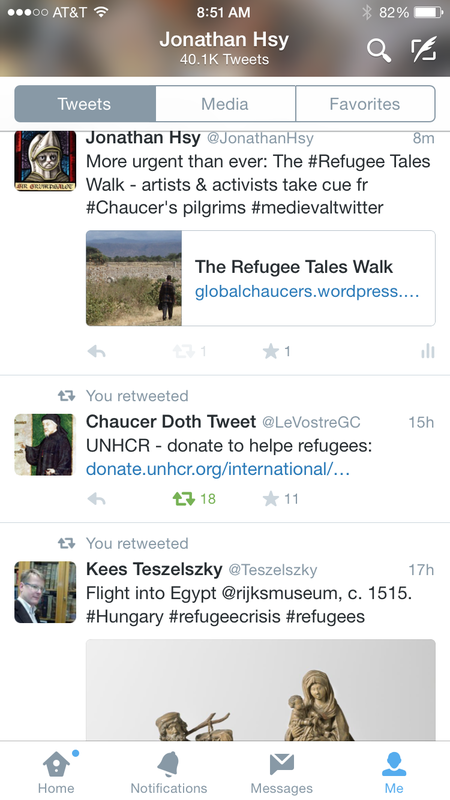 The Chaucer tweeter (@LeVostreGC) urges his followers to support the UN Refugee Agency. Popular media (especially social media) has deployed the adjective “medieval” to varied ends: sometimes the term targets refugees themselves, but other times refers to the perceived mentalities of governments (European as well as Middle Eastern) in response to this crisis [I won't link to particular examples here, but a quick search for "medieval" and "refugee crisis" certainly brings up examples]. Jewish traditions of welcome for strangers (from The Guardian, September 5). Coverage of the Pope's very recent call for Europe's Catholics to welcome refugees (The Washington Post, September 6). Forceful critiques of nativism and Islamophobia in responses to the refugee crisis in Europe and online (The Conversation, June 24). 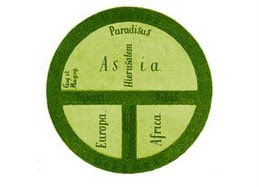 Historical context: In an earlier conversation on twitter (after the mass murders in the Emanuel African Methodist Episcopal Church in Charleston, SC, and subsequent news coverage of an online racist screed attributed to the shooter), Karl Steel stated that we as medievalists must be prepared to disrupt racists’ idea of "Europe." As indicated in the article about nativism and xenophobia linked above, the refugee situation has laid bare political anxieties over a "Muslim takeover" of Europe, and related fantasies of a white, Christian nation can become the implicit or overt basis for excluding refugees from over land or sea—and not only in Europe but also across the so-called “Global North” of industrialized countries (e.g., Australia, Canada, New Zealand, United States). [Top half of image: The opening to The Man of Law's Tale (illus. 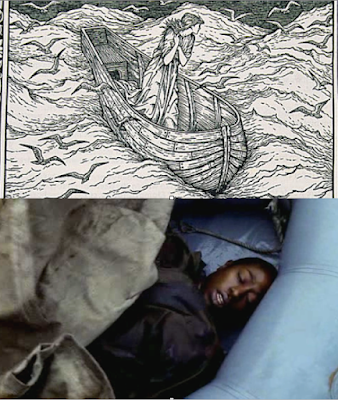 Edward Burne-Jones) in The Kelmscott Chaucer (William Morris, 1896) depicts Constance set adrift on a rudderless ship. In addition to addressing a broader historical view of "Europe" and its meanings over time, how might medievalists think more carefully about analogies made between the lives of medieval people and refugees today? The Refugee Tales Walk (mentioned in Part I) provocatively invites people to contemplate similarities between the plight of present-day refugees and experiences of medieval travelers, with a clear ethical and political objective: building compassion and solidarity with displaced peoples and using art and storytelling to combat prejudice. In a blog post from over a year ago, Steve Mentz reflected on Caroline Bergvall's book Drift (2014), a work that juxtaposes the Anglo-Saxon elegy "The Seafarer" with the story of a boat of Algerian refugees that was seen—but not rescued—by NATO vessels in March 2011. Troyer's discussion tantalizingly ends there, and there's much more about this classroom experience that could be explored. 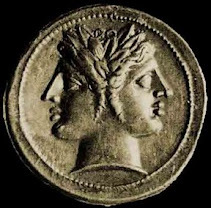 How does an affective response to a seemingly alien medieval world change how one thinks about (im)migraiton, desire, hope, nostalgia, life trajectories? I'll just end this posting by asking few questions. What are the ethical investments of medievalists in this current humanitarian crisis (or any crisis, for that matter)? How (or should) we address urgent present-day concerns in our scholarship, in our classrooms, online, or in the streets? Thanks so much for that reference, SM: I'm a big fan of Caroline Bergvall's "Meddle English" (teaching it this term!) but hadn't yet come across "Drift." I will look forward to reading it, and thanks for these links. I've added your blog post to the list above, and if you do end up extending/expanding what you wrote about it let me know.